Airport: 40 km., Railway Station: 15 km. Hotel Dona Sylvia is located in the heart of the tourism belt with major attractions of the city spread along the way. Dona Sylvia Goa is an all inclusive resort that is designed in a Mediterranean Style Resort. Resort is spread over 26 acres of landscaped gardens that remind one of the pleasure of living in a oasis of pleasure. Located right next to the beautiful Cavelossim Beach of South Goa. 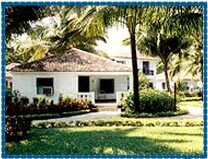 The resort offer a blend of Mediterranean with the warmth of Goa. 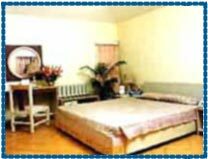 Hotel is well known among its religious followers because of the personalized touch of the service offered by the hotel. The Dona Sylvia resort offers a total of 176 air conditioned rooms that are designed in Mediterranean styled villas and air conditioned rooms with attached bathrooms, running hot/cold water, television. A blend of old-world charm and contemporary comfort, in a choice of rooms and suites with verandas and roof-top terraces. Travel desk, Money Changer, Laundry facilities, Safety Deposit Box, Conference facilities, Internet facilities, Health Club & Gym, Beauty Saloon, Ayurvedic Massage, Souvenir Shops, A very large swimming pool with a separate child pool, Indoor Recreational Facilities ( Pool Table, Table Tennis, Carrom and a variety of board games), Outdoor recreational facilities ( Volleyball , Tennis & Air Hockey), Water sports (Seasonal), Air conditioned rooms, Hot/cold shower, Telephone without direct dial, Room Service, Television, Mini bar, Writing table, Ceiling fan, Balcony, Sitting area in the room, Daily Newspaper.